Address: Avenida del Mar, s/n, Costa Teguise (Lanzarote), Islas Canarias. 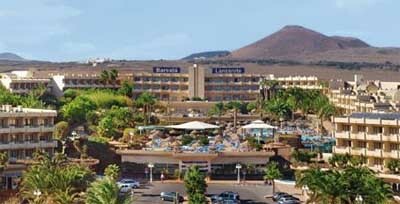 Occidental Lanzarote Mar (formerly Barceló Lanzarote Resort) is just 350 metres from the Ancla beach. It offers 3 adult and 2 children’s pools, one of them Olympic size. The air-conditioned rooms at the Occidental Lanzarote Mar feature satellite TV, a minibar and a private balcony. The bathroom comes with a hairdryer. The hotel offers a kids’ club. There is also a playground, mini golf course, human-size table football, wellness center and gym. The buffet restaurant serves international food and offers show cooking. There is also a poolside bar and a lobby bar featuring live music and entertainment. Central Arrecife is a 10-minute drive from the hotel. You can drive to Lanzarote airport in around 15 minutes. Guests are required to show a photo identification and credit card upon check-in. Please note that all Special Requests are subject to availability and additional charges may apply. When booking half board, please note that drinks are not included. Please note that guests must present the credit card used to make the reservation on arrival. If you are not the owner of the credit card used to make the reservation, please contact the property in advance. Please note the published rates for stays on 25 and 31 December include a mandatory fee for the gala dinner held on those evenings. Please note that only the number of guests indicated at booking can enter the property. External visits are not permitted. Please note that the use of the Olympic pool carries an extra charge.